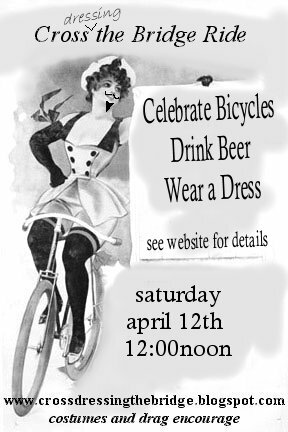 This Saturday, April 12th, you can celebrate the unofficial opening of the Cumberland River Pedestrian Bridge by throwing on your finest sundress and riding your bicycle across the bridge. Participants should meet at noon on Saturday at the Public Square near the Woodland Street Bridge and Second Avenue (map). The course will follow Davidson Street in East Nashville to Shelby Park and along the paved path in Shelby Bottoms Greenway to the pedestrian bridge. Riders will take a break for snacks on the other side of the bridge before returning via the same route to downtown and then on to the Yazoo Brewery for the post-ride cool-down. Sponsors of the ride, including Urban Velo Magazine, Walz Caps, and Swift Wick Majic Socks, will provide some give-aways for participants. Hensley encourages riders to dress in drag or a costume and to wear a helmet, but notes that fashionable attire is not required. The ride is free and open to the public and will proceed rain or shine. Hensley notes that organizers have planned a casual group ride and not a race, so cyclers of all abilities are welcome. UPDATE 4/10/08: Metro Parks and Recreation has not yet opened the Pedestrian Bridge to the public. Hensley still plans for the group ride, but is not planning to cross the bridge if it has not been opened to public traffic by Saturday. Ugh! Why can’t these kinds of things be advertised in more places sooner? It appears to be a trend in Nashville that anything cheap and interesting is only advertised the day before or day-of. I’d love to go to something like this, but – and I’m sure most of you can sympathize – my weekends are booked up usually a couple weeks in advance!